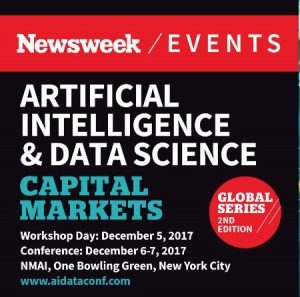 CloudQuant will be participating in the Newsweek conference on Artificial Intelligence and Data Science for the Capital Markets Industry on December 5th to December 7th, 2017 in New York. This conference will cover the abundance of cheap and powerful computing capacity is bringing artificial intelligence to bear on an ocean of data, across a range of industrial applications. For CloudQuant this includes tools including Python programming language, Jupyter Notebooks, SciKit-Learn, Technical Analysis Library TA-Lib, and our own CloudQuant are making it easier for anyone to enter the world of algorithmic trading. Improved access to information is also making it easier for the world to reach into the world of data science applied to trading and data science. StockTwits, Alexandria Technologies, Twitter, LinkedIn, Reddit, Quora, and more are all publishing insights into the world. Individuals, both professional and personal, are publishing more insights into the world. Google, Bing, Benzinga, Newsweek, Bloomberg, Reuters, and others are all making it easy to find relevant, high-value data that previously were not easily available. YouTube, LinkedIn, Quora, SMB Training, QuantInsti and others are all teaching anyone interested in trading and algorithm insights that 5 years ago were not available to anyone other than a select privileged few at well-capitalized trading firms. Panel Discussion with CEO Morgan Slade is speaking on on December 6th at 14:30. Follow AI & Data Science on Twitter.